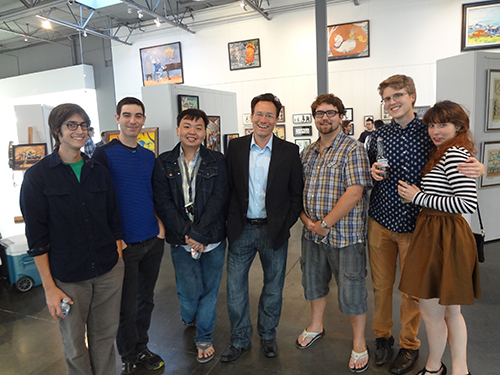 Last night, the Center was the epicenter for student art from Laguna College of Art & Design. Selected by the Chairs of the Animation and Illustration Departments at the college, Dave Kuhn and Michael Savas, respectively, 50 works of art were on display at the Center by 22 students, from freshmen to graduating seniors. President of the college, Jonathan Burke, was so moved by the quality of the work that he selected several works for the college's permanent collection. The students exhibiting are: Ye Htut Aung, John Bajet, Justin Bechtold, Autumn Bell, Jenny Calabro, Courtney Candelario, Melissa Chen, Gabriel Del Valle, Catherine Esquerra, Ludia Fenwick, Ashleigh Izienicki, Audrey Jung, Cheryl Kook, Jasmine Lee, Clayton Lindvall, Kristen Maslanka, Breanne Paulsen, Alex Salyer, Michael Scarberry, Sharlene Tuiasoa, Michael Wansing, and Jesse Yang. To view photos from the reception, click here!The exhibit will close June 30. The Chuck Jones Center for Creativity is located at 3321 Hyland Ave., Suite A in Costa Mesa, California.